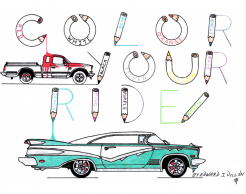 This delightful coloring book for people of all ages features lovingly rendered precision drawings of cars, planes, and motorcycles. "This coloring book came about as a result of my love of freestyle drawing when I was a small child and to my introduction to mechanical drawing as a young adult that continues to this day," writes artist Edward J. Dillon. "I owe my thanks to my father, Edward P. Dillon, my wife, Mary Ann, and all of those around me who encouraged and believed in me and my artistic abilities. I only wish my mother, Patricia, were here to see this book in print. She was always one of my biggest supporters." Artist's Tips: For detailed drawings in this book, the best medium for coloring will be colored pencil or specialty pens. A wide variety of colors are available in both media at your local art supply store. Crayon will also work, though it will be more difficult to color some of the fine details. I think you are right, by displaying the conyras in the legos, they are easier to see plus it adds a new dimension to coloring - kind of making the conyras into manipulatives you can sort and organize. Great idea.